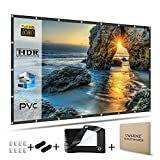 A great alternative to buying a pre-made projector screen is to make it yourself. You may go with a white screen for a dark room or a black screen for a bright room depending on what suits your needs. While most pre-made projector screens can cost more than $100, a DIY projector screen may be a smarter and cheaper alternative. 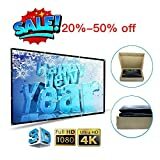 We are going to cover various ways to create your own projector screen on a budget. With a little bit of cardboard and some paint, you can make your own projector screen. It works great for a small group of people on any occasion. Depending on what you have on hand, this may only cost a few dollars to make. This budget-friendly DIY projector screen idea is a fast and simple solution. 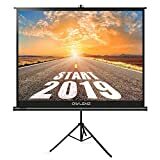 It is great for those who are looking for a stress-free projector screen that will look nice. The only tool needed is a pair of scissors. This is a fast solution for creating a projector screen and just requires a cloth adhered to a wall. There are basically no tools required and instead of eyelets, you can choose to use upholstery tacks. This is a space-conscious approach to a projector screen that uses a simple home roller blind. You can project your movies onto the blinds attached to your window, or instead of mounting it into a window you may choose to mount it on a wall in order to roll it up after you are done with it. If you are craving for your own theater room then this is the perfect tutorial for you. This is an easy task that anyone can make with a little help, it will just take a few hours and the tools necessary are nothing fancy. Just follow our instructions and use the recommended material and it will come out great! You can also check out our DIY projector tutorials to use with your new projector screen. 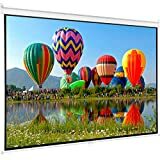 Here is a painted-on projector screen that works really well for use in your home. All you have to do is plan out where you want it on the wall, get the supplies needed and start painting. Using a textured wall will make the image look distorted so please keep that in mind. You can also look into how to make your own home theater speakers. Just sand, paint and mount this easy to make DIY projector screen. It will be cheaper if you make this without the frame in one large piece. An idea to mount this is to screw through the plywood directly into the wall and apply over it the laminate sheet. 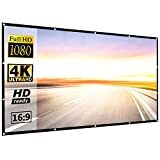 A professional-looking framed projector screen that will work great hanging on a wall in your home. You are going to need an electric drill, staple gun, and screws. This large-scale projector screen setup is designed for use in a big home theater system. It won’t be able to move easily but it looks great. You will need a measuring tape, saw, braces OR pocket hole system, electric drill, screws, staple gun and stud finder. 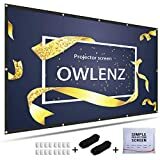 This is a DIY projector screen designed for easy movement. Its design focuses on the use of PVC pipe which is easy to find and very affordable. Only a saw will be needed for tools. You can build this screen projector yourself just under $$, which also includes how to make a tripod mount for your projector. 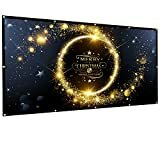 The tutorial below will guide you on how to build this classy 93-inch fixed projection screen by using cheap screen material. For a massive DIY projector screen in an outdoor setting, this project will work great. 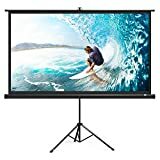 You can expect it to cost over $100 but it is a much cheaper option than a pre-made projector screen. The tools required will be a reciprocating saw, electric drill, tape measure, marker, and a ⅜ inch ratchet with appropriate fitting sockets. We are sure you will find some useful information on our DIY list that will help you out. 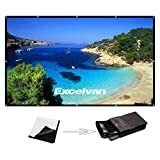 The projector screens shared here are a much cheaper solution than buying a pre-made projector screen of a similar size. We hope that you enjoy attempting these DIY projects and share your thoughts about them. If you have any other DIY projector screen suggestions, please feel free to share them below. Moreover, if you are not done setting up your entertainment corner, try out this DIY TV stands list.